February 1, 2012 Jack of all trades SOMA BASU The Hindu YOUTHFUL ENERGY: Selvaraj Suthagar. Photo: S.James Selvaraj Suthagar on how Abdul Kalam fired his imagination His visiting card does not carry his name. It simply says: ‘F@YS – What service demands’ and lists two numbers. The moment he flashes the small black visiting card with fluorescent blue prints on it, something tells me he is the typical restless youth wanting to do too many things in one go. He confirms it: “My head is bursting with ideas, but I don’t have the matching time, money or resources.” Thirty-one-year-old Selvaraj Suthagar compels you to wonder how after failing Class X Board exams, he has become a multi-tasker racing against time. F@YS stands for “Friend at Your Service” and he means and stands by these words. “You just have to tell us what you want and we will be at your doorstep, ” he asserts. And his work can mean anything – from de-silting a clogged drain to painting your home, from arranging eco-treks into forests and hills to growing organic crops in your backyard, from painting vehicles to repairing electrical gadgets, from plumbing to rolling steel sheets at construction sites, from coaching youngsters in different games to setting up cricket bowling machines in malls, from teaching traffic rules and signals to reading road maps to students, from helping tribal people with basic amenities to adding to his collection of old bikes, gramophone and other antique items. It is this veritable assortment of odd jobs that he chooses, gets to do and also delivers, that take away some sadness from his life. It keeps him excited and happy as he looks forward to his next mission, which could be either in the adjacent lane in his neighbourhood or in the picturesque hill range of Theni or Sirumalai. “Born into poverty and having suffered all along, I am a self-motivated man today. I have understood that to achieve something in life is nothing but to have the interest and the drive to accomplish it, ” he says. For him, the journey began when he flunked Class X exam. “From Class V, I have been helping my mother to boost family income. She would do odd jobs in the Church and get Rs.150 a month and I would do things like fetching water for residents in apartment buildings or running some errands for them and earning few extra bucks. As a result, I could never focus on studies.” At 15, he shifted to Chennai and did a short course in operating cranes. But he joined as a cleaner boy in a Cottage Industries Emporium showroom. With a penchant for languages, he soon picked up a smattering of French, German and Spanish while interacting with tourists. Impressed with his determination and flair, the Branch manager posted him as caretaker of a showroom in a star hotel. From there, he moved on to IDBI Bank as a document verifier. “On my weekly off, I would go to the beach and play with the children around. Many days I would make some models with all thrown away cigarette boxes and other waste.” He was spotted by an employee of Satyam Computers and taken in as a Floor Supervisor for the office. Three months into joining, the then President of India Dr. A.P.J. Abdul Kalam came to inaugurate a new building for the R& D wing. “It remains one of my most memorable days as he ignited our minds and told the young employees to keep firing their imagination with new ideas and innovative thoughts.” Suthagar’s appointment letter was due to come when the Satyam fiasco happened. A colleague, who used to accompany him on some occasional treks during holidays, introduced him to Eco-Login, an initiative of some students of IIT-Madras, that incorporates social dimension to trekkers’ schedule. Their work matched his passion and he is now back in Madurai as the marketing manager of Eco-login tying up customized and theme-based experience trips with 40 exotic locations to choose from that range from adventure, wildlife, nature hotspots, rural and city circuits. “Travel is an uncompromising part of anybody’s learning. But I don’t find many enthusiastic people in Madurai, ” rues Suthagar, who is now busy visiting schools and colleges to help them plan their field trips and excursions. Last time he undertook a trip with 63 members of a family who were re-uniting from all over the world. “It was one week trekking and staying with tribal families in the forest areas of Periyakulam. This experience will remain with me, ” he says. Suthagar has now identified 30 tribal locations and formed a core team with each of the groups to coordinate such treks. “It is a fantastic opportunity to learn and also help them, ” he says. Right now, he is working with Paliyar tribe in a small village called Malaiyur, 18 kms off Madurai, helping them with medicines, clothes and coaching the tribal children. “I collect old and new clothes from people who want to donate. My mother and I wash and iron them before distributing them among the tribals, ” Suthagar shares. He has dabbled in so many things that it becomes difficult to keep track. In between, he also finished a diploma course in film technology from University of Madras and few other polytechnic courses. “I have a burning desire to keep on learning something new. You can trust me with any job, ” he smiles. South indian Tour Packages, South Indian Backwater Tours, South Indian Hillstation Tour Packages, South indian Temple Tours, South Indian Beach Tour, South Indian Wildlife Tours, Houseboat Tours in Kerala, Honeymoon Tours in South India, LTC Tour Packages, Weekend Tours in South India, Cruises, Green Kerala Tours, Hillstation Tours and much more…Call +91-7604837477. God Bless everyone who travel with us and the visitors of this website. 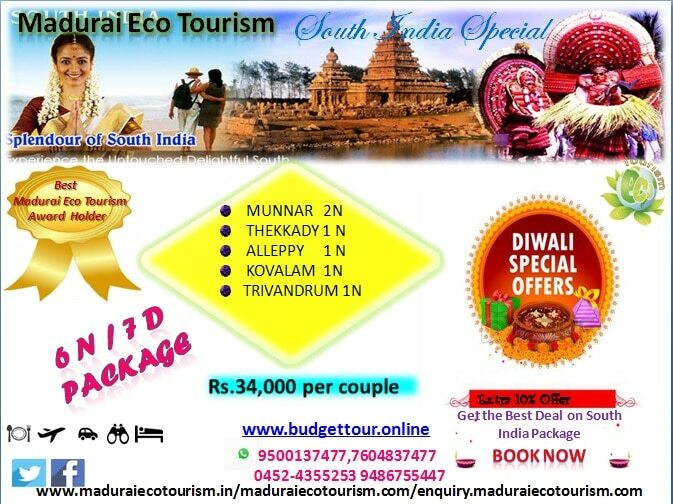 www.maduraiecotourism.comHappy Travelling with us..